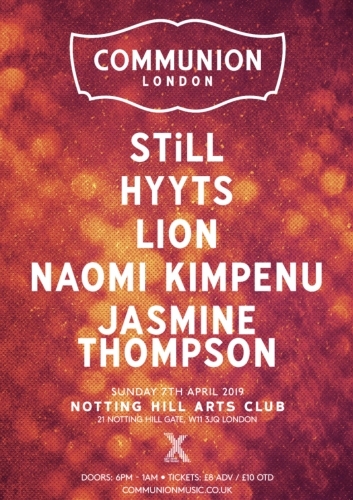 Live Music from STiLL, HYYTS, LION, Naomi Kimpenu and Jasmine Thompson. STiLL’ bring you soul quenching Rock & Roll, with an infectious live set of hard hitting riffs and potent lyrics, it really is a breath of fresh air on the Big Smoke scene! After packing out their first string of London dates and gathering interest with their powerful debut EP ‘This Is Not An Exit’, they are not one to be missed! This Glasgow alt pop duo have grown known for their intoxicating melodies, smooth vocals and potent lyricism. Having already sold out shows back home, toured with Howl & the Hum and garnered support from publications including Clash Magazine, we’re excited to see what they’ve got coming up next! Having been told that the Janis Joplin-esque rasp of her voice make her sound like a lion, in combination with her lion-like mane, Beth Lowen chose to adopt the moniker LION, a stage name that never feels more apt than it does when Lion performs live and unleashes her full potential. Think White Stripes and AM-era Arctic Monkeys via the ‘70s-inflected rock of Jefferson Airplane. We’re sure rising soul pop star Naomi Kimpenu will soon be the name on everybody’s lips. Make sure to come down early to catch so that you can tell everyone that you saw her first! Having started her career as a YouTuber at the age of 10, making it into the Top 40 at the age of 13, becoming signed by a major label at the age of 14 and leaving it all behind her at the age of 16, Jasmine Thompson has managed to already live through more than most people do in a lifetime. Still only 18 years old, but wise beyond her years, Jasmine has finally found the creative clarity she’s been longing for which has resulted in the new EP ‘Colour’ due on March 29th.